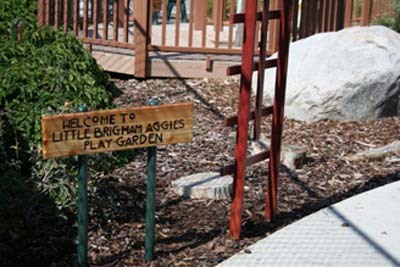 A wooden sign stating “Welcome to Little Brigham Aggies Play Garden” greets guests as they make their way into this nature-rich space. 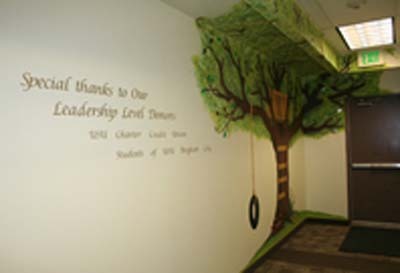 The Climbing Area includes a tree house, a large boulder, stepping logs and balancing logs placed in wood chips. 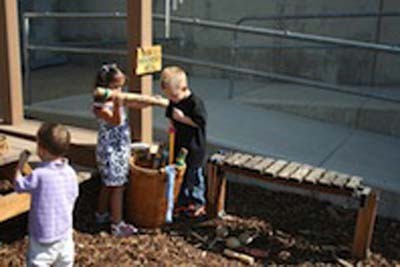 A hand-woven willow tunnel arches over a cement wheeled toy path creating interest. Barrels and raised planters at different levels above the ground outline the Garden Path while vines and trees add interest and beauty throughout the outdoor classroom. 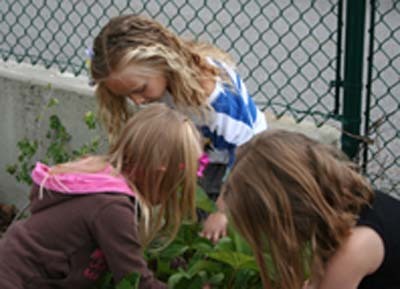 The Sand, Messy Materials and Dirt Digging Areas allow children to enjoy feeling the richness and diversity of the earth. A set of picnic tables under a wooden pergola provides a quiet sanctuary for the Nature Art Area. 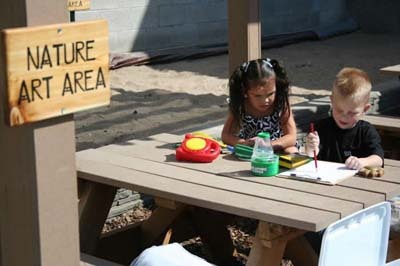 Clipboards, colored pencils, measuring tapes, magnifying glasses, bug catchers, observation mirrors, pinecones, sticks, and bird’s nests allow children to observe, measure and record. With Nature Journals in hand, a stroll around the classroom turns into an adventure while children gather nature items, draw pictures and write notes. Beautiful musical sounds resonate from wind chimes, cactus rain sticks, drums and an akambira. This variety of instruments and dancing scarves encourage children to make music and move their bodies. The Open and Action Areas include grassy hills designed for children to run, roll, and do many other large-motor activities. Tree blocks and other pieces of tree trunk are available for the children to build and manipulate in the Building Area. A shed houses all loose parts and keeps them protected from the weather. 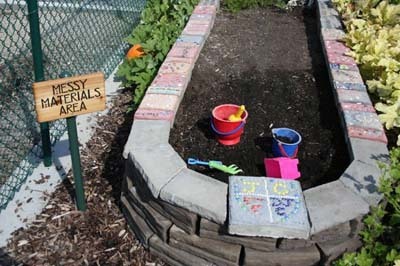 Designed by the USU Extension with ideas from many people, this Play Garden is described as a full donor space. Staff, parents, volunteers, businesses, and individuals within the community donated their time, talents and money to create the space. 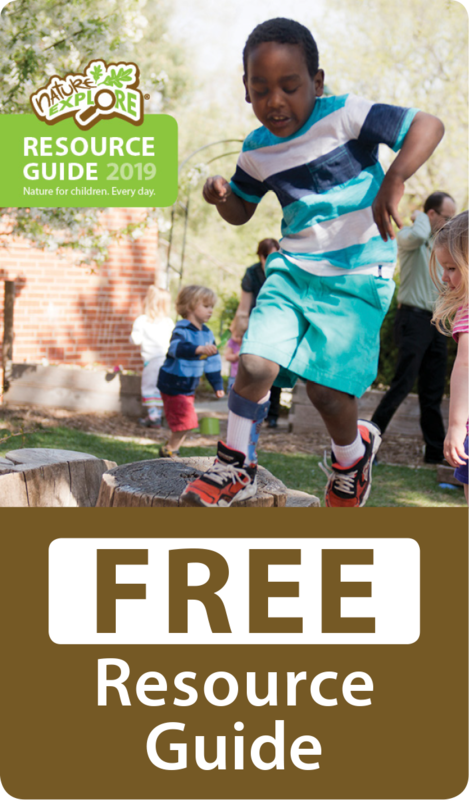 A large grand opening, open houses, and newsletters help Little Brigham Aggies Nature Explore Classroom share in the joys and excitement of connecting children with nature.